The Purple Planet - send a happy shout out or photo to your loved ones anywhere in the world. Happy Spots – send a random gift to someone at the Cadbury World of Happiness. Happiness Tour (Cadbury World of Happiness) – come experience a magical time of happiness at our fun-filled event & Cadbury Happiness Factory. Bump up the Happy Meter, and Cadbury will double up the happiness nationwide with free Cadbury Dairy Milk bars! 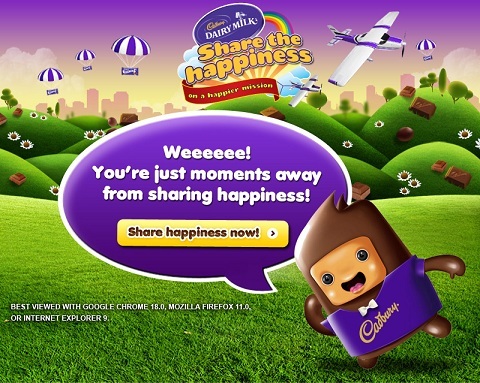 Visit Cadbury Dairy Milk - Share The Happiness for more information!